HCFoo's Tennis Blog – Tennis Celebrity Photos, News, Gossip and More! 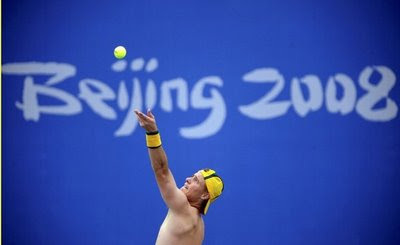 : Shirtless tennis players: It's hot right here in Beijing! 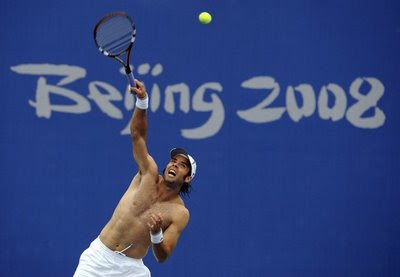 Shirtless tennis players: It's hot right here in Beijing! It was hazy and it was definitely hot in Beijing yesterday! With that kind of weather, there's only one things for the ladies, shirtless players. Novak Djokovic, Guillermo Canas, Nicolas Massu, Fernando Gonzalez, Jonas Bjorkman, Lleyton Hewitt and Rafael Nadal (pictures all in sequence) sure couldn't stand the heat and took their shirts off. Nadal's picture is a repeat from this post. UPDATES: Checking the latest weather report, it's raining now in Beijing, which is good for the Opening Ceremony tonight.